Asahi Camera, May 1982; Moriyama, Hikari to kage [Light and Shadow], Toju-sha, 1982 (fig.C); Holborn, Black Sun: The Eyes of Four, Aperture, 1986, p.71; Moriyama Daido: Nihon no shashinka 37 [Japanese Photographers, Vol.37], Iwanami Shoten, 1997; Phillips et al., Daido Moriyama: Stray Dog, San Francisco Museum of Modern Art, 1999, pl.86, no.170, titled 'Tokyo'; Moriyama, Inu no kioku shusho [Memory of Dog: Epilogue], Kawada Bunko, 2001, front cover (fig.D); Daido Moriyama 55, Phaidon, 2001, p.103; Daido Moriyama, Fondation Cartier pour l'art contemporain/Actes Sud, p.33; Hunter of Light: Daido Moriyama 1965-2003, Shimane Art Museum/NHK Educational, 2003, p.217, pl.328, titled 'Light and Shadow'; Daido Moriyama: The Complete Works Vol.2 1974-1992, Daiwa Radiator Factory, 2004, p.201, no.2041, variant cropping dated '1982'. 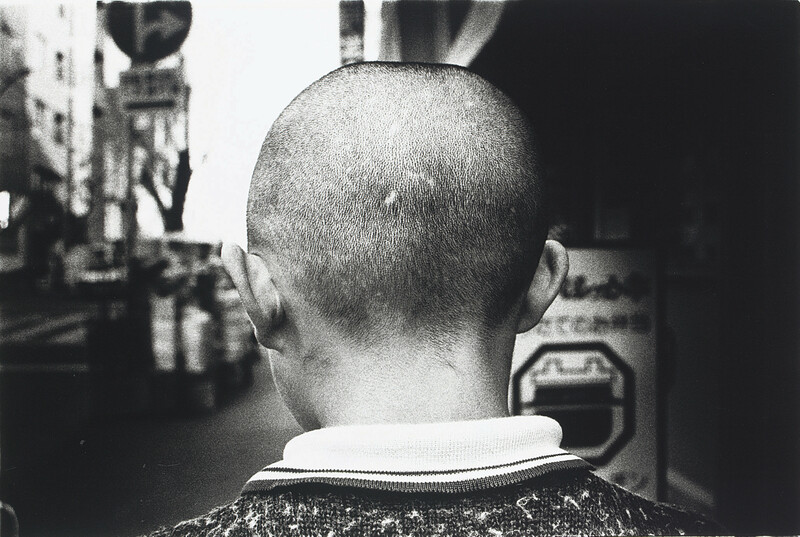 This important image of the back of a boy's shaved head appears in Moriyama's 1982 book Light and Shadow, which marks his return to photography following his post-Farewell Photography hiatus. He moves beyond the PROVOKE aesthetic to achieve a new clarity -- a black and white world of light and shadow. Light, simple light hitting an object, has presented a clear, pure and lucid outline to my eye.